The Cuban sandwich, or the cubano, is a classic Florida creation that has become legendary throughout the United States. It is technically just simple ham and cheese pressed between two slices of bread, but the Cuban is so much more than just some meat, cheese and bread. 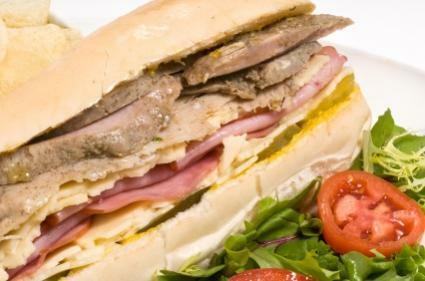 A Cuban sandwich is created with ham, roast pork, pickles, mustard and Swiss cheese on a traditional style Cuban bread. There are a lot of myths that surround the Cuban sandwich, particularly considering its origin. No one is 100 percent certain where and when the Cuban was invented. Its close relative, the "sandwich mixto" was a common item on restaurant menus in Cuba during the 1930's. They were incredibly popular among workers in the Cuban sugar mills.Prior to the Communist revolution, Cubans traveled easily between the country and Florida, going back and forth between the two areas for work and family. There was so much Cuban influence in Florida during the turn of the century that the cubano eventually became a staple in Ybor City and Key West Florida. By the 1960's the Cuban had become a popular restaurant item in Miami, particularly after the city had an influx of Cuban immigrants after Fidel Castro's communist rise to power in the late 1950's. Florida's Cuban population grew exponentially over the last few decades of the 20th century, so much so, that today the country's culture and cuisine are considered a fundamental part of the areas where they settled. What Is a Cuban Sandwich? A cubano is made up of some very specific ingredients and methods, most importantly the grilling press or sandwich press (called a plancha), which provides a steady application of heat and weight that fuse the sandwich together while warming the ingredients throughout. The bread is also an important ingredient, calling for Cuban bread, which is very different from an Italian or French-style bread. It is a long, crusty loaf that contains lard and is tender in the middle rather than chewy. This loaf is sliced into 8 to 12-inch lengths, which are lightly buttered and then cut in half horizontally. A traditional cubano is then slathered with mustard, then layered with succulent roasted pork, glazed ham, Swiss-style cheese, and sliced dill pickles. American regional variations include the Tampa-style cubano which is layered with Genoa salami, an Italian influence from immigrants who lived in the same neighborhoods as the Cubans. In southern Florida and Miami it is standard to add mayonnaise, lettuce, and tomato. Once the ingredients are layered up the sandwich is then toasted on the plancha, which is similar to an Italian panini press, but without the grooves. The cubano is then pressed until the bread is crispy and the cheese is melted and gooey. It is easy to make cubanos at home, but you have to have the right ingredients and the proper tools. Preheat a pancake griddle or fry pan to high heat. Slice the bread into pieces about 8-inches long. Cut these pieces in half and spread with butter on both sides. Once the sandwiches are layered place them on the hot griddle or fry pan that are properly greased with butter or bacon fat. Place a heavy skillet on top of the sandwich to flatten and crisp the bread and melt the cheese. Grill the sandwiches until the cheese is melted and the bread is a gold color, about two to three minutes, then slice the sandwiches in half and serve. Mash the garlic, salt and peppercorns until it comes to a paste, using a mortar and pestle. Stir in orange juice, onion and oregano. Heat the olive oil in a large saucepan. When hot, remove from heat and whisk in the garlic mixture and cool. Rub the pork all over with the garlic marinade and let sit in the refrigerator for about two to three hours. Roast the pork in a roasting pan for about 20 minutes per pound, basting every 10 minutes until the internal temperature reaches 160 degrees F.